HAND MADE Le Creuset cast-iron Dutch ovens are sand-cast, painstakingly polished and finished by hand, then sprayed with two coats of enamel and fired twice. No other procedure yields cookware that so evenly conducts and retains heat. These stylish, durable Dutch ovens offer the reliable results of enameled cast iron, while doubling as a fun and festive serving dishes. Perfect for slow cooking everything from soups and sauces to chili and chowder. With a wide range of sizes and vibrant colors, you’re sure to find just the right one–whether you’re making dinner for two or serving a holiday feast. Heavy-duty lids create a solid seal to retain heat and moisture and integrated cast iron handles ensure easy transport. Suitable for all heat sources: electric, gas, halogen and induction. First - The color “Sea Salt” is beautiful. The cooking experience with Le Creuset is like no other. It is perfect for making a soup, broth, chili or stew at the beginning of the week to have for the rest of the week! Love it! Wish we had bought it years ago! I have an older Le Creuset of the same size that has smaller handles. It’s versatile, and easily my favorite pot. So I figured if having one is good, having two is even better!! But in all seriousness, I was excited to get the new color and have the larger handles, which definitely makes moving it around a lot easier. The gold knob is an extra special touch... I got the brown (morel?) color, but now I don’t even seen it offered anymore! The bride loves her dutch oven! I always enjoy giving Le Creuset because I enjoy mine so much ch! This one does it all. Boiling, frying, roasting. Will survive the zombie apocalypse. This is my second 5.5 qt oven...the first I gave away after 12 years of use. Very versatile piece and perfect size. 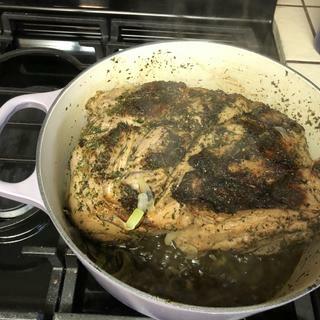 I love my new Dutch oven. I have used Le Creuset products for years and have quite a collection. The 5.5 quart is the perfect size for my husband and I since our kids are grown and out of our home. I love the new color, too. Thanks to Sur la Table for carrying this amazing product. I am so happy with this purchase. So far I have only made soup and chili but they came out fantastic. I got the color "palm" and it is so beautiful. I want to get another size asap. I def recommend this. A kitchen staple and investment piece for a reason, this is a true workhorse. I have only had my Dutch Oven for less than a month but I am regularly impressed with the quality. It can roast, bake, sauté and simmer with the best of them. 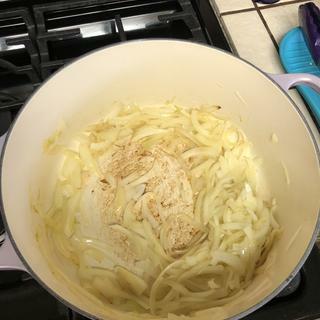 I have even made fried chicken strips in this pot and the results were amazing. 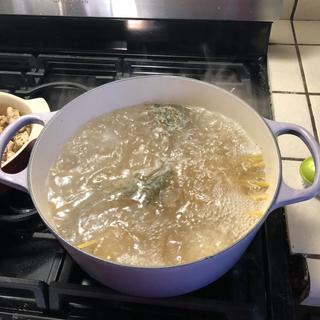 I love my le creuset and plan on adding a few more Provence colored pieces to my kitchen. A quick note on cleaning, I have been strictly hand wash only with hot water, baking soda and dish soap with a sponge. My son loved the gift!!! Easy to use!!! I love this size. Perfect for soup, roasts - everything! Not too heavy. Great for soups and stews! Goes from stovetop to the oven without a worry! Love the look and functionality! Best staple I’m my kitchen! My favorite dish ever!! I make everything in this and it cleans up like brand new!! My favorite wedding present to give too! You will love this and so worth the money!! Best investment EVER! 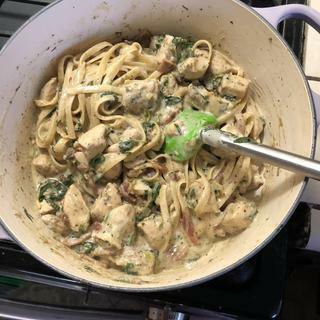 Cooks like a dream, easy cleanup, and it's beautiful to bring to the table! Can't think of a single thing negative, except that of course, it's heavy. I can handle it. This is a cooking pot everyone should have. I gave this Dutch oven to my grand daughter as a wedding gift. She and her husband were thrilled and can't wait to use it. On daughter's registry and top of the line item. Wonderful to cook with, and attractive for serving. Le Creuset is the choice of my family chef. My hope is that the piece will perform flawlessly for several years. Great brand and good price! The quality of the name and the color ( sea salt) is gorgeous. I needed a large dutch over to be able to cook all my soups in one pot. I've had two of these for years and love how versatile they are. They're too expensive for my sister to buy for herself but she deserves the best and I wanted her to enjoy cooking with a beautiful big pot. The size and cost. Not necessarily happy with the color. Great price on the best brand. Thick enamel and great size for about anything you could want to cook. Fits a nice sized chicken and vegetables. Love these pots. Have a 24 and a 28 but was sorely missing the size 26. Thrilled to find it. Looking for a dutch oven for my mother and I liked the color and price. Le Creuset products are excellent. I needed a 5.5 qt and have been watching prices and sales. The morel color was much less expensive than other brighter hues. I wanted something that was non-stick and could go from stove to oven. I have several Le Creuset pots and they are awesome for stews and soups. I use them in place of slow cookers and put them in the oven at low heat. Best results ever. It was on their registry with 5 stars and the spatula was Seattle - where they live. As a long time Le Creuset user, I am actually phasing out other non-enamled iron cookware. I'm replacing an older piece that I've used for almost three decades. I already have two of this item and they are in different colors. This product is awesome to cook with. I like them very much. This one is going to my daughter and this is the color she likes. I love Le Creuset and have used my pots for many years. My niece just got her first apartment and I wanted to get her started with her own collection. 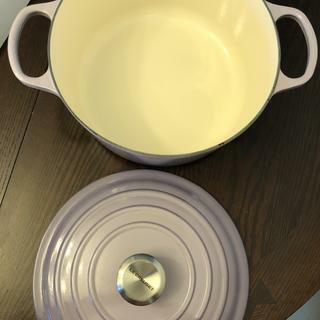 I bought this as a gift for my wife and wanted a quality item that would last, our previous Dutch oven was a Lodge brand and the porcelain coating only lasted 2 years. Please confirm I ordered red. This is an amazing pan, once in a lifetime purchase. Your sale price today is a great deal. Have always wanted a Le Creuset pan and this price was amazing! price and quality of the item. What is the weight of 5.5 Dutch oven? What are the dimensions of this 5.5 qt pot? What size dutch oven do I need to serve 14? BEST ANSWER: You need the 13.25 quart dutch oven. What is the knob made out of? BEST ANSWER: The knob is plastic, but it's made to withstand high heat. They sell stainless steel toppers you can use instead if you so wish. What number is on the bottom? How high can the oven temperature be with the lid on? As high as you need. These are cast iron with a ceramic coating. I’d your house burned down your pot would be intact. What material are the handles (not knobs) made of? I've been reading this brand has plastic handles on their dutch ovens. Is this true? BEST ANSWER: Handles are cast iron just like the rest of the pot. They are one solid piece of cast iron and not screwed in or attached by anything. We just bought a flame dutch oven and the handles are part of the enameled cast iron. So definitely not plastic! It does mean that you have to use potholders to pick it up when it's hot. The handles get got too. The little top knob on the cover is some sort of plastic and doesn't get as hot. We really love it; it makes good soup, stews and curries. The handles are part of the vessel and are cast iron. They do get hot so make sure to use the proper protection when handling. Best cookware ever! Thank you all for the prompt responses! Now decide between this brand and Staub! NO PLASTIC!! The handles are enamel coated cast iron.....the best on the market. Are these perfectly flat on the bottom for cooking on a flat ceramic stove top? BEST ANSWER: Yes, these Dutch ovens are flat on the bottom, I’ve used them on gas and electric cooktops both with great results. how do I remove stains from the enamel? BEST ANSWER: I use Barkeeper's Friend. Just moisten a cloth or sponge and sprinkle it on and scrub the vessel. I rinse and wash it with detergent to remove any residue. Works great every time. Comet, bleach, baking soda, soft scrub.......any of these will work. Just don’t scratch the enamel. Clean up easily. What is the height of the Le Creuset 5.5 qt Signature Round without the lid?